Oak + Cru Social Kitchen and Wine Bar at the Delta Grand Okanagan Resort. Photo courtesy Delta Grand Okanagan Resort. Who knew there was a hotel in the heart of Kelowna that was so swish in both vibe and amenities? If you hadn’t known either, you would be more than forgiven as this is a reincarnation of a hotel originally built in 1992 following a $9.4 million renovation. It just reopened this June. 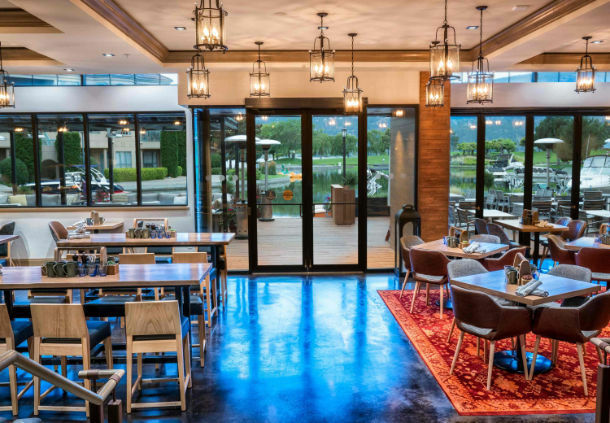 At its centre is the Oak + Cru Social Kitchen and Wine Bar that buzzes with activity and music, even at breakfast, with a patio that looks onto the waterfront view and boardwalk. Amenities include an indoor/outdoor pool, fitness centre, an on-site spa, and a handful of other retailers. The wine bar showcases only British Columbia wines. And with the complimentary airport shuttle service, this is a definite recommend.